Do you like to share your choice of music with the rest of the world, never mind that some of the folks out there think that it is pure torture to listen to artists like Justin Bieber (hey, to each their own, right? ), and you tend to perform your sharing using a boombox (if you are old school, of course), or a portable speaker? Portable speakers can be cool, and even cooler with the right kind of music, but to have them tethered to your music playback device like a portable media player or a smartphone is not all that hot. Not in the second decade of the 21st century, anyways. Why not live untethered with a Bluetooth speaker, and here is an idea that you might want to explore – the Urchin Ready 4 Anything (R4A) rugged Bluetooth speaker? At first glance, you know for sure that the BOOM Movement is no ordinary pair of Bluetooth speakers. Urchin’s Ready 4 Anything (R4A) rugged Bluetooth speaker was specially designed to go with you in style for sure. It has been designed to stand out, and is more than capable of withstanding just whatever you throw at it. Sporting Urchin’s interchangeable silicone skins, it will enable you to have the Urchin gain its distinct clean look, and not only that, it offers shock and water resistance to boot. 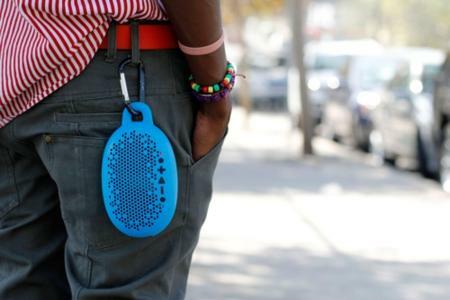 The Urchin itself will come with a carbineer so that you are able to hook it to a belt loop or backpack, and if the situation calls for it, there is a suction cup that allows you to stick it to a shower tile, while there is also a screw mount attachment for the dash of a car. Alternatively, it can also be used with the optional bike mount or strap attachment. As for the Urchin’s silicone skin, it has been molded with a hole at the top, allowing it to be easily attached to just about anything with everything from a screw in the wall, to a rope tied around a tree. You can also opt to turn the Urchin into a hands-free speaker for any Bluetooth enabled phone, thanks to its integrated microphone. Just make sure it supports Bluetooth Version 2.1 + EDR or higher. The BOOM Urchin will retail for $149.99 when it is made available early next year.